Which appears to be a mainstream hypothesis today. My question is, if there is a genetic mutation that occurred in one individual which made their eyes blue, and the rest of the population is brown eyed, how does this make so many individuals blue eyed? If the blue eyes are recessive, the individual's children would mix with the other brown-eyed individuals and their offspring will be brown-eyed. How does anyone treat this theory seriously? @another 'Homo sapien' is basically correct, and what they were getting at, is that in just the F1 generation, you're right, any recessive traits are masked. However, if you continue this onward, in subsequent breeding, recessive traits are unmasked. (This is basically why inbreeding is a bad thing). You can see that a single recessive allele is now present in 50% of the offspring of a given pair of parents. Now, if in F2, we assume that 2 of those recessive offspring were to mate, the recessive gene would be unmasked in 1 quarter of the offspring (statistically speaking), and 50% would be carriers. Now it gets a little more complicated. Our double recessive F2 member has blue eyes phenotypically, they aren't just a recessive allele carrier. 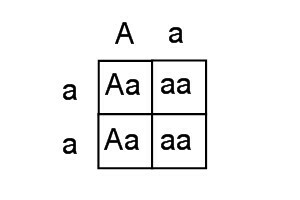 So, if in F3, our aa mates with another aa, (ignoring spontaneous mutation for simplicity) it should be obvious that all of their offspring in F3 would have blue eyes (and I can't quickly find a Punnett square in Google showing this). 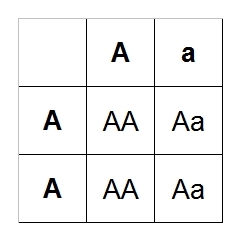 However, if our aa now mates with an AA (homozygous dominant brown), we will get 100% offspring with a heterozygous Aa genotype - in other words, all blue eye carriers, but with brown eyes phenotypically. And thus, 50% blue eye individuals, with 50% brown heterozygous dominant. And so on and so forth, ad infinitum. Hopefully that explains how a recessive allele can go to fixation despite only occurring once. How Much Longer For The Gene For Blue Eyes?